First and foremost... 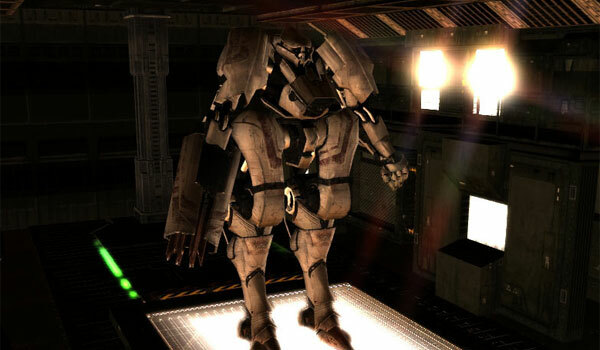 I would describe myself as a technophile and a fan of CG anymation and machinima. Especially small team or individual projects. Born and raised in the sparsely populated Texas Panhandle I turned to computers to pass the time and from there went on to do freelance work in many fields. The WarLord nickname is an old Dungeons And Dragons name from my college days at Texas Tech University and has nothing to do with war or a love of war even though I seem to do quite a bit of war related movie work. This is one of the most asked questions from my website. Q: What's your experience in iClone? When I first discovered iClone I had been through a steady evolution in freelance that lead me from programmer to webmaster to graphics artist to 3D Designer culminating at that time in several opportunies as a storyboard artist for some indie studios. 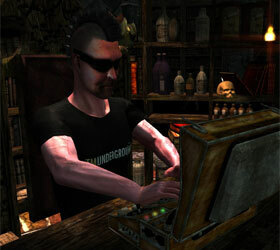 I was also heavily involved in 3D scene and prop making during that time. Mainly as a journeyman that handled whatever was sent my way. I became frustrated with the storyboard programs at the time and found iClone through a web search. Not sure how I found it but I'm sure glad I did. Within minutes of downloading the program it paid for itself. I used it that night to create a shot sequence with several alternates including angles not even discussed by the creative or visual group and sent them in with my next batch of work. The response wasn't exactly immediate... in fact it took longer than usual but then I found it was because the storyboard and shortlist had been circulated to people in the project for feedback that had never been included at this level before. The number of creative minds powering the team more than doubled by just having the ability to recreate a shortlist and send it to so many people so quickly. 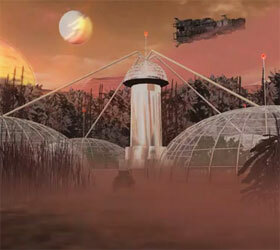 Revision were done within hours instead of days using iClone with simple scenes and stock actors. The impact on that particular project was amazing. At the time I was and still am using Studio Max but I was introduced to 3D via 3D Studio, Bryce, Lightwave and Maya. The studios I worked for were Max shops so I devoted more time to Studio Max. I started when version 1.0 was released. iClone was extremely easy to learn and render compared to Poser and other character alternatives. In fact there was very little learning curve at all in those days. We didn't even have a free camera then. My first iClone movie was a James Bond movie because I was working on a Bond project at the time and needed to use the visualation iClone created. From that point on iClone worked its way into my daily production pipeline and soon became one of the programs I worked with on a regular basis. Q: We've seen the tutorial you made for Post Magazine, can you share with us what' your experience in using iClone in the production pipeline? I use iClone in my pipeline every chance I get due the speed and ease of which a scene can be created and rendered out. Saving time in this industry saves money and at times can mean a nice bonus. Post products like After Effects, Hit Film and others allow me to blend the output of differing animation engines making a superior final product. Another aspect as was mentioned in the Post article concerns the management of animation teams. Any competent professional animator can pick up iClone and be animating objects on a path or using character animation tools in a matter of minutes without ever having seen it before. The concepts are straight forward and simple to execute when you are already familiar with 3D work. This in turn frees up more experienced animators to tackle the tougher challenges of the project and keeps it on track and as is most important in the entertainment industry moving forward. Any delay in production is extra expense so being able to assign certain parts of any project to anyone on the team has its advantages. iClone not only frees up specialized talent it does so quickly with little learning curve for those pros stepping up to use the product for the first time. Q: Where did your ideas come from of designing low poly crowds series? And how do you produce these content? 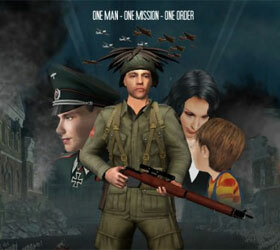 I needed to have a few hundred soldiers on screen at one time for a particular project. Characters were out of the question due to the poly count. Even a 5K character drags down the engine when 300 or more peeps are involved. Early Peeps had various levels of detail as I brought the poly count down to a bare minimum. The balloon heads were chosen due the fact that even very lightly detailed faces with nose and mouth added to the load on the engine and decreased the number of Peeps onscreen. The average poly count for a Peep dropped to a little over 900k. The low poly Peep is actually created in Studio Max as a skeletal character with either a CAT rig or a Biped. It could just as easily be exported as a non-standard character that works with iClone animations. In fact I have a working character version of most of the Peeps. The walkabout crowd is actually a crowd with behaviors scripted into each Peep then the animation is baked in and exported for use in iClone. iClone gives me the ability to put animated props into the hands of users in this case with no other interaction necessary on the part of the animator. Just drag, drop, position and press play. Q: What are the general compositing features that you think iClone can benefit video producers? It extremely easy to render out blue, green screen or any background color video. You can also render out an alpha video if preferred. These are essential to any composition as they must seamlessly integrate with the keying tools of compositing software. Compositing is 2D and that throws a curve to new 3D animators that have no experience with it. When you think about it all final renders are 2D. All compositing does is hide or show certain parts of a render. Rendering out easily composited videos with the proper background makes the task much simpler in terms of keying out the background making it a one or two click process without a lot of cleanup work. The image layers and billboards with opacity channels are also a plus as you can overlay images or video to these props and create your own layers within iClone. Q: What are the top tips to handle large scenes with good performance real-time in iClone? The poly count of a model is important but no longer the only guideline particularly in the 64 bit version. I still use 30,000 faces as a general guideline when creating a character but I regularly put characters of several hundred thousand to a million faces in a scene. There are steps that can be taken when working with a large scene. Saving out groups of objects, especially high poly objects, then reloading them before render is an easy option. Set up your objects then attach them as one and save them out as a prop. When you are finished with other work in the scene and ready to render double click on the newly saved group prop to have it load into the scene at the original location. Another very important aspect of iClone is the level of shader you are working in. If you are in Pixel Shader mode and iClone starts to slow down then switch to a lower shader such as smooth. You may end up in wireframe but it will allow you to complete your scene. You can also setup individual items with a shader of choice such as normal, smooth or wireframe. Identify your high poly objects and turn them to smooth or wireframe to relieve the load on the engine and keep the props in the scene for visual reference. Another very important aspect of filling a scene is using images planes rendered from the objects in the background of the scene. If these objects are far enough away from the camera turn off anything in front of and behind them then render it out. I usually created a 32bit TGA as it has embedded alpha information and maintains quality but the PNG format also has embedded alpha information. Remove your props from the background and replace the area with an image plane then drag and drop the TGA or PNG on the plain, position and scale. If you do this successfully you have the same look with less faces to stress the engine. Q: How do you think about the toon shader and NPR features in iClone5? The Toon shader and NPR Post Effect is like having an entire team of cell shade animators without the hassle or the associated cost. With a few settings you can turn a 3D project into a very convincing 2D cartoon/illustrated look that completely changes the mood of a project. In my "Ode to the Visual" the Toon shader along with the NPR post effect made the film pop out like a 1960's hand animated short feature. The versatility of the Toon shader settings along with the post effects and atmosphere really bring a lot to an animators toolbox. I was asked many times what application I used to animate Ode and I consider this to be high praise for any engine when you can't easily recognize its output. In the "Air Duel" demonstration video I used a monotone pallet of earth tone browns instead of high color or line art. I spent a little time experimenting with the various Toon shader, Atmosphere and Post Effect controls before discovering a combination that matched the "cartoon in my head". It is very rare that I actually get that close to what I'm visualizing versus what I'm able to get on screen. To just change a few settings and turn a 3D project into a very convincing 2D project is a major leap in production methods. Saving time is the biggest plus and when a animator saves time it usally means saving money for their project or putting more money into their pockets if its a freelance job. The benefits of these features are just too numerous to list if you do any 2D cartoon or animation work. The time savings alone make the entire iClone product pay for itself very quickly. Q: What's Sci-Fi Destructible Props Collection? Its basically a collection of Sci-Fi warships, both capital and fighters, combined with space elements such as asteroid and debris fields, an exploding planet and one of my favorite props which is a planet with a cracking surface. 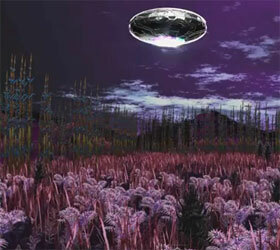 There are also several high quality space backgrounds that were created in Vue to enhance the look of a space scene. My idea for the asteroids and planets pack was to provide a lot of detail to a scene that can help sell that scene to the viewer. There are over forty props in this special combo pack. I have also worked hard to bring some extensive 3D Max based animations to iClone in a simple right click menu format that iClone users are familiar with. If you need a lot of ships on the screen at one time you can load one of the animated fighter groups that will fly to the enemy and attack but stop the animation before the group swarms into attack formation. Load several of these using different camera angles and you have an armada of ships on screen fully animated with only a few clicks. Each flight group consists of more than twenty fighters so three groups is over sixty fighters on the screen at one time with only a few placement clicks. Saves a lot of time over placing 60 fighters individually or animating them individually. Q: Tell us more about your iClone book. What is it about? 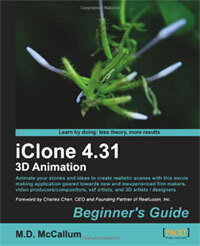 The book is about basics and fundamentals of iClone and animation in general. As the title "iClone Beginners Guide" denotes it is a starting point for new animators or for experienced animators that want to get a headstart on the iClone interface and production methods. Many tips and tricks from the community, the technical reviewers (Bigboss, Joe & Susanna Pass) and Reallusion are in the book. In fact there are few pages if any that do not contain at least one tip or trick. There is a main project to teach basics and a bonus space project with a custom exploding space freighter prop that allow the reader to put what they have learned to work making a convincing space scene. I also added tips and tricks that I have picked up from the industry such as lighting, camera usage and layout among many others. These tips are gleaned from years of working on projects that range from a few hours to a couple of years by the time the final production is released. There are new projects under discussion which include updating the book to version 5 or possibly writting a new book based on V5 advances. Even though the book says 4.31 on the cover it does have extensive appendices that cover the new features of version 5. There has also been discussions of writing a book for 3DXchange 5 that will take a complete 3D newbie through the basics of character and prop conversion. Q: What do you consider the biggest leap in terms of new features in Version 5 that will directly aid new animators that have never attempted to animate anything before? The new animation tools and I'm not talking about Motion Capture which is great in itself but the new animation tools such as MixMoves and Motion Puppet along with the HumanIK technology from Autodesk makes animating a much simpler task. Throw in the new Reach Target feature along with curves and you can have as smooth an animation as you want without a lot of work. In most cases none of this involves manual keyframing unless you just want to tweak the animation more. The ability to mask out body parts with the Motion Puppet allows for the layering of animations in the timeline. We can use MixMoves or any motion clip then go into the Motion Puppet and mask out the body parts that we don't want to be effected by the new motions. This combines the two motions into a great animation. The ability and power of MixMoves to seemlessly morph from one motion to another is another major leap in the evolution of iClone. These tools either by themselves or combined are worth the price of the Pro version to me without even counting the numerous other features in version 5. Q: What's your important content or video creation in your iClone user history? I have to say "The Sniper" which I released in February of 2009 and seemed to have a very long life span. It was nominated for several awards at the end of the year which shocked me as it had been so long since its release. After that would be the newest release of The Outland which featured the props of this combo pack. The "Machinima Vs Animation" series with Dulci has also been well received by a wide audience. Copyright © 2015 Reallusion Inc. All rights reserved.